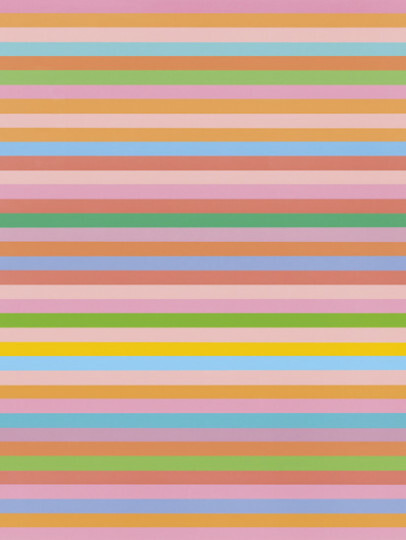 Bridget Riley was born in London, and spent the war years living in Cornwall. After a spasmodic start to her education, she returned to London to study at Goldsmiths College, graduating to the Royal College of Art in 1952. Her approach to painting was slow to evolve and it was not until 1960 that she made her first essays into optical painting during visits to Spain and Italy. All her paintings of the early 1960s were in black and white. Riley quickly developed a style comprising regular patterns of line and colour which cover the entire surface of the painting and appear to shift and vibrate while they are in fact static and rigid. Colour was introduced in 1966, first as warmer and cooler greys, then as vivid contrasting pairs such as red and turquoise. The artist described these works as being concerned with principles of ‘repose and disturbance’.